The Republic of Gerovar is nestled in the central European mountains which are considered the Swiss Alps. The population of Gerovar consisted of approximately 50 individuals during the last census in 1975. Gerovar subsists mostly from goat herding and it is not a popular tourist destination because of the difficult terrain and lack of roads. Swiss Cheese is generally made from cow's milk. 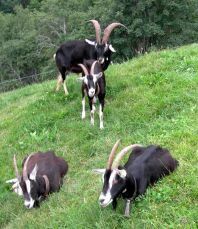 Gerovar cheese is made from 100% natural goat's milk. Compared with cream cheese, goat cheese has twice the calcium and half the saturated fat calories. Fresh goat cheese is a simple, satisfying cheese that goes well with any appetizer or wine. It is a truly nutritious treat! In a recent a television interview with 100 citizens of Bern, which is about 30 kilometers away from Gerovar, none of the people interviewed knew about this tiny republic. Without doubt, Gerovar's most famous citizen is Madame Flora who has distinguished herself as a psychic advisor and has won world-wide acclaim for her insightful psychic chats. 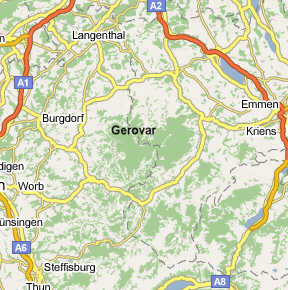 Gerovar is situated in the Napfgebiet which is the hilly region lying between Berne and Lucerne. Mount Napf is the region's highest peak with an elevation of 1408 meters above sea level. The region is bounded by the Emmental to the south-west and the Entlebuch to the east. It is divided between the cantons of Berne and Lucerne and by the Brünig-Napf-Reuss line. Gerovar is counted both geographically and geologically as part of the Swiss plateau and its efforts to gain independence from Switzerland have been largely ignored because the Swiss Confederation has a long commitment to armed neutrality. Switzerland has an air force and an army, but it has not been in a state of war internationally since 1815. Switzerland has a prosperous economy that is famous for its Swiss bank accounts, high-tech precision products like Swiss Watches, and versatile tools like the Swiss Army Knife.